all that you want it to be! As our name indicates, we offer everything exterior for your home including windows and doors, gutters, shutters, both vinyl and cement based siding, and of course roofing. We use reputable products such as Mastic, James Hardie, Royal Building Products, Owens Corning Roofing Materials and GAF Roofing Materials. We can provide samples of our product so that you can make the best decision for your home and your budget. Our company has served the Atlanta area for over 20 years. 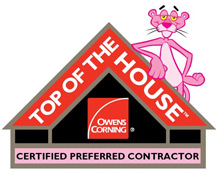 We are an accredited member of the Better Business Bureau, members of the Home Builders Association, a Mastic Preferred Contractor, an Owens Corning Preferred Contractor, and a GAF Certified Contractor. We are licensed and insured and certificates are available upon request and will be sent from our insurance provider. Your home is a valuable investment. Please take a few moments and browse our site to see the quality workmanship we offer and the types of products that we use. You can also get to know us a little better. We provide a page for FAQs that may assist you in answering questions you may have concerning your home. Thank you again for your consideration of our company and we look forward to doing business with you. Great. The house looks absolutely beautiful. The workers were polite and very professional. The contractor kept a close watch on the job. I definitely will hire them again. I was also pleased with the price. A good friend of mine needed the cedar siding and underlying material on her chimney replaced. We got T&J to do the work. The job went great; the crew was prompt and efficient and they cleaned up the work site to the point that you could not tell they had been there. I would recommend T&J for any type job and will definitely use them again if we have any exterior work to be done.